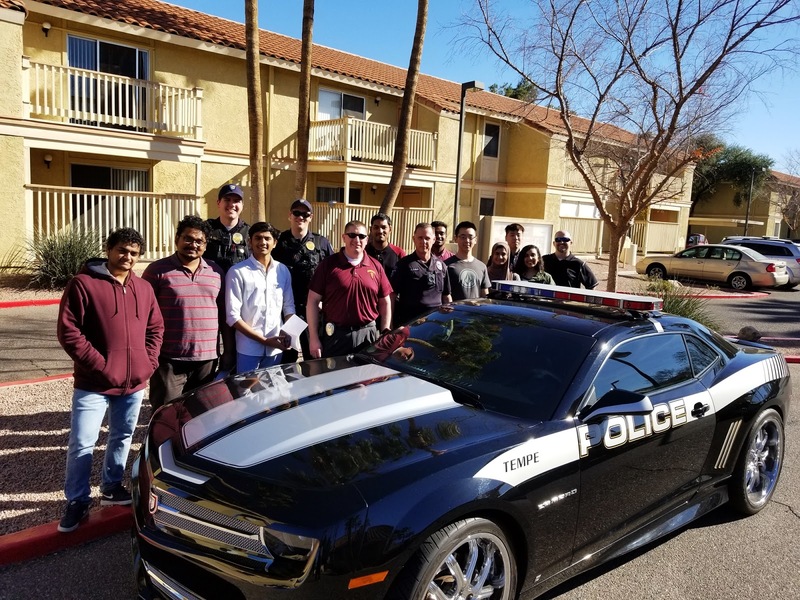 Coffee with Cops is an event hosted by the Coalition of International Students in partnership with the Tempe Police Department, Arizona State University Police Department and the ASU Dean of Students office. 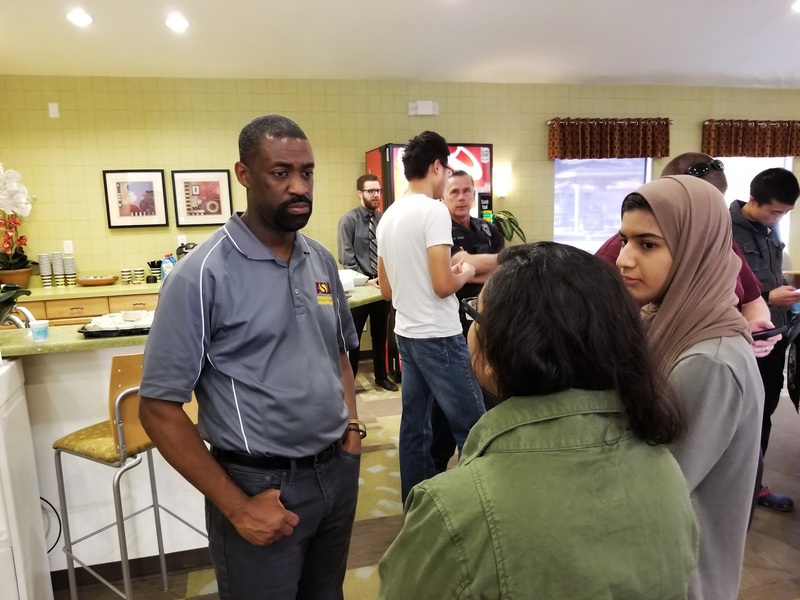 This event brings police officers and the community members they serve together–over coffee–to discuss issues and to learn more about each other. Community members get an opportunity to ask officer questions face to face. 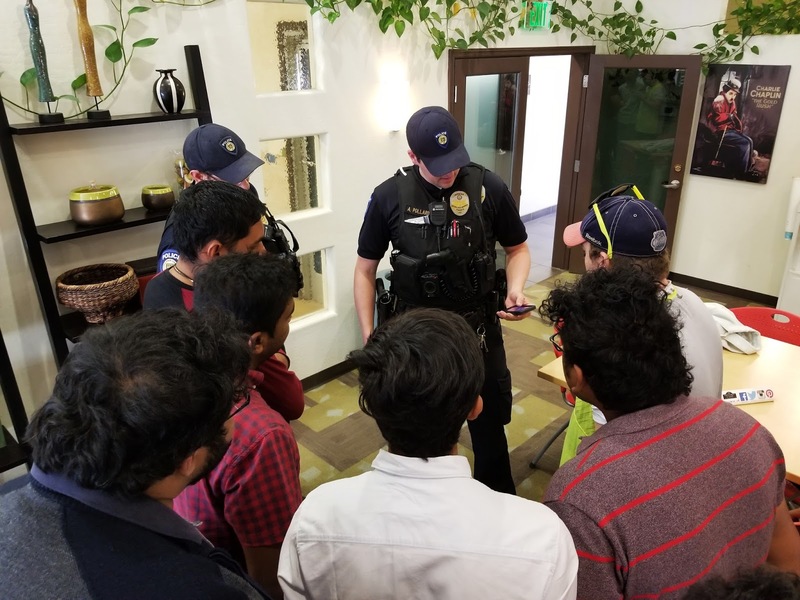 The event which was open for the community and public was held at 12fifty5 on University Apartments and Desert Palm Village. The event was broken up into 3 main sections. The first section focused on clarifying that Police officers in the U.S. are approachable and ways to approach them. The second thing on the agenda was personal safety on campus and when travelling out of state. Lastly, the floor was opened for participants to ask questions to the police. You can live better after you getting to know more rules, we encourage you to join this event and hope to see you there next time. Below is a list of Question and Answers that was collected during the event. 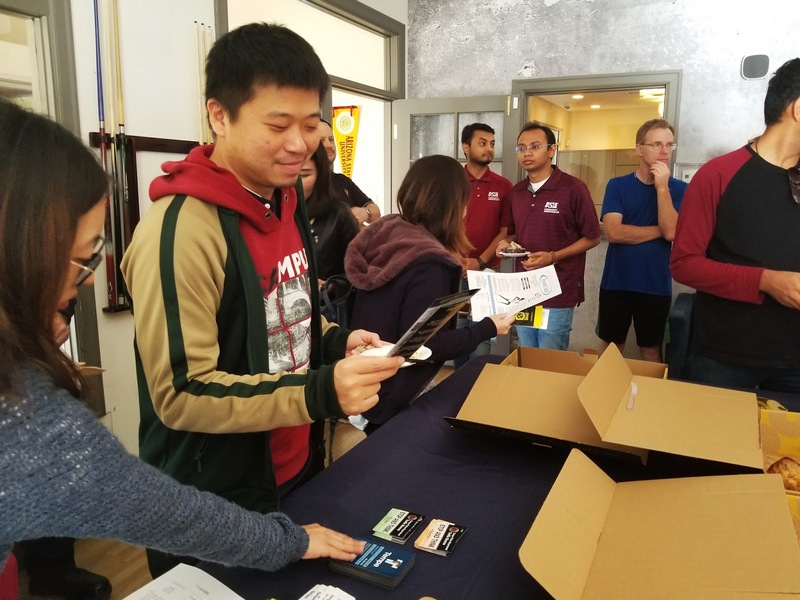 Q: Is an ASU ID sufficient to bring along and be used as a form of Identification? A: No, ASU ID is not a real ID because it doesn’t tell the person’s birth date or the address of the person. Q: Do we have to take our passports and I-20 with us to verify who we are? A: You can just take the passport and you can make a copy of your passport, so you won’t lose it. Q: If I hear a disturbing loud music and didn’t know which apartment it’s coming from can I call the police? A: Yes, you can call the police or the complex leasing office whenever they disturb you even if it was at daytime, but it would be preferable to know which apartment number it is. Q: What should I do if someone throws something at me from their car while driving? A: Take their license plate number even if you couldn’t get their plate number the police want to know if these kinds of incidents occur more often, so they can do something about it. Q: What should I do if I walked a street and it was really dark and afraid that someone will harass me or do something to me? A: Call city information and tell them about the dark street, so they can replace the lights that are out and you can also be aware of what they look like and describe them to the police. Q: What should I do if I felt threatened in my apartment complex? A: You can call the police or the complex leasing office and lock your apartment door. Don’t leave anything unguarded and don’t leave anything important inside your car and always lock your car. Q: What should we do if we got mistaken by the suspect that the police are looking for? A: Do exactly what the police officer tells you to do. Don’t scream or yell because things will be more complicated and at the investigation the police will know that you’re not the suspect that they are looking for. Q: How do I know if the police wants me to pull over? A: They will have their lights on behind you and if you didn’t notice them they will turn on their sirens to get your attention. Q: What should I do when the police pull me over and approach me? A: Keep your hands on the wheel and do what they say. If you weren’t sure that they are real officers, you can ask for ID and later you can call the police department about the officer. Another thing, if you have a weapon inside your car you must notify the officer about it. Q: In lieu of the accident involving the bike rider who unfortunately passed away, and the driver of the truck wasn’t held responsible. Is there anything we can do on our part to be safer? A: Due to limited knowledge of the incident, no specific comments were made, but on a general note, bicycles are considered as cars in Arizona. All the same laws apply to a bike which do to a car, if there is no bike lane, instead of driving on the side walk, ride on the road, and the lane you occupy is yours and the cars are supposed consider you as such and will not approach you. This does sound scary, but this is how the law wants us to behave. Based on the same fact, we should be careful about our biking just like a car. But it should be kept in mind that everyone needs to behave the way they should while on the road. 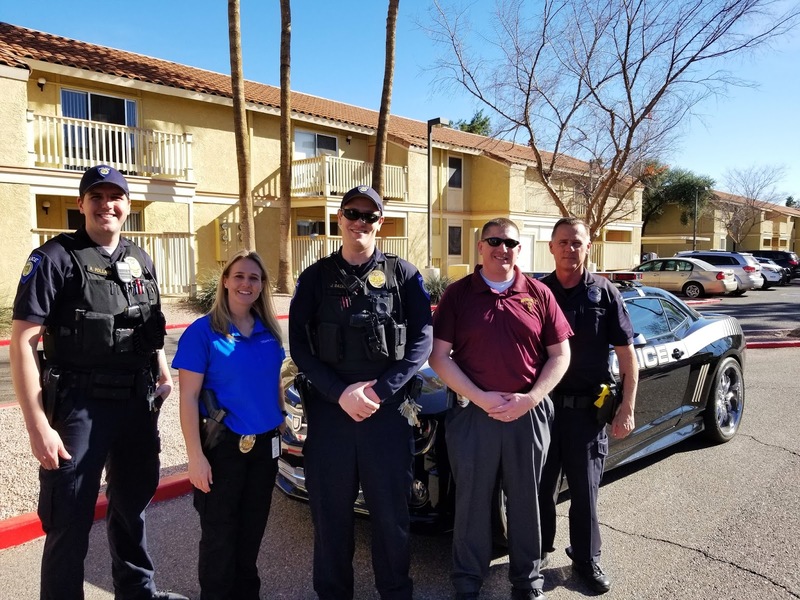 ASU and the city of Tempe, are trying to work out ways to make it safer for everyone. Residents can help out by calling the city information number (480-350-4311) and reporting if there aren’t enough lights, or you feel that a specific crossing is too prove to accidents. Q: Technically, international students are not allowed to carry guns. Having said that, there are students who carry a weapon. A general clarification of the situation would be helpful. A: International students are not supposed to carry guns, and the only exception to this law is if you’re going for hunting. The punishment for carrying a gun, is being deported back to your home country. Please tell the student that they are not allowed to carry firearms. To use a gun you need to be trained, and know the laws that go around with using a gun for self-defense. The police is here to protect us, as even carrying a gun for protection might not be helpful as in real life scenario, there isn’t enough time to use it. Q: As an international student can we carry any other type of weapons other than guns? A: You can carry a Pocket knife, a pepper spray (but in a little tiny can which can be used once only not a big one which can be used multiple times) This all you would need. The pepper spray really hurts. You need to cautious while using it so that you don’t spray it on yourself. You need to train a bit with spraying of the pepper spray. Avoid going alone and be as a group of people to avoid being into a situation. Always walk in well lit areas. Be alert. Run, Jog t reach your destination faster at odd hours. Carry flash lights. Irrespective of what you are in try to figure a way out to get out of the place somehow even abandoning your belongings. THE BEST FIGHT TO WIN IS THE ONE YOU DON’T FIGHT.There is no wrong in running away from a situation. Do not give space for a situation to arise due to your carelessness. Be alert! Weapons are really a hard thing to use. If you are interested and if you don’t know how to fight for SELF DEFENCE, our ASU Police dept provides you training. (Website : https://cfo.asu.edu/rad ) It is R.A.D and is separate for Men and Women. This training is for the whole community and not only for the ASU students. This course is funded by Police and you would get a certificate in the end. The program has options for disability people as well. Q: AZ allows the cars to have tinted window, but some states don’t. What if we travel to another state? A: You can still drive around to other states but the police might pull you over and write you a ticket. Though that is very unlikely to happen if your car is registered in Arizona. Q: When it comes to motor cycles, how exactly is it different from different states? A: State of Arizona does not allow lane switching. If you are in a lane, you own that lane. Other cars can not approach you in it. Apart from that all other rules that apply to cars, are applied to motor cycles. Q: What if a student, or any civilian feels threatened by the police office approaching them? A: All ASUPD and TempePD officers wear a body cam, which remains on while the officer is on duty. If the student feels that the officer was aggressive, or does anything inappropriate, in the moment if the officer doesn’t ask you to do anything inappropriate, just comply with them and once everything is done, ask the officer politely his/ her name and badge number, which they are supposed to provide, and then call their agency and report the incident. You can also ask them to connect you to their supervisor. The supervisor can then go over the incident via the footage provided by the body cam. The officers have no control over the footage, they can’t delete it, or modify it. But all things said, in the moment, always comply with what the officers want you to do. the officers are usually acting on a very limited amount of knowledge, and if they feel the least bit threatened, they will escalate the situation. Most of the people joining the law enforcement join to help people. They have to achieve that goal in various ways, but in they end they just want to keep everyone safe. Additional reporting by Zhen Wang, Fatmah Yousef, Siddhant Srivastava and Ramachandran Ramakrishnan.